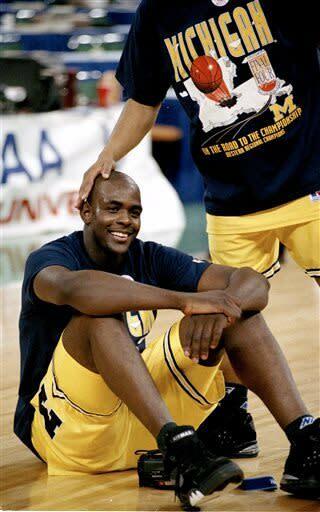 On Wednesday, with the conclusion of the NCAA's astoundingly clueless but purposefully humiliating 10-year "disassociation" penalty, the University of Michigan is inviting former basketball star Chris Webber to give them a call and discuss if he wants to be a part of the family again. He may have to apologize first, though. What Michigan should be doing is calling Webber and saying sorry to him. This case stems from NCAA rules that Webber violated as a player from 1991-93. In short, he accepted money from a man named Ed Martin, who doled out cash and gifts to lots of young Detroit players through the years. Only some of them went to Michigan, but it was Michigan that gave Martin comp tickets and access to hotel room blocks. I have a long-standing opposition to the NCAA rulebook (which isn't the point of this column) but like the rules or not, there is little doubt they were violated here. Michigan was punished and under the NCAA system that's fine. 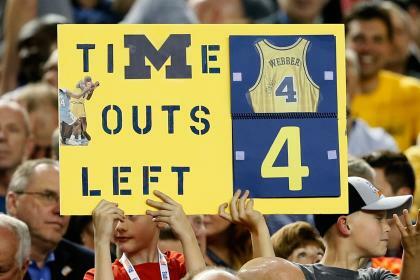 The NCAA vacated the two Final Fours that Webber's Fab Five reached. The banners commemorating those seasons were taken down. There were other sanctions too, especially since Martin was also involved with other Detroit kids-turned-Wolverines such as Maurice Taylor and the late Robert Traylor. The most puzzling – and unfortunate – penalty, however, was when the NCAA forced Michigan to "disassociate" itself from Webber and the others for a decade, a term that ended on May 8. The disassociation worked well in pushing the spotlight of blame away from the system or the coaches or the administrators or the circumstances or even Martin, and right on the players. It's all Chris Webber's fault! Never mind that the university has numerous buildings bearing the name of Alfred Taubman, a billionaire donor who actually went to prison on antitrust charges and it never disassociated from him. This was the NCAA! This was bad! And besides, isn't Webber sort of unlikable and aloof? Didn't a lot of people hate that hot-dogging, baggy shorts-wearing team of his? And didn't he once complain it wasn't fair that he couldn't afford to eat at McDonald's while the school sold his jersey in the bookstore when, in fact, he was flush with Martin's money? What a liar. It all fit nicely in a box, wrapped in a bow. Come back and apologize C-Webb, and we'll even show you how to forgive and forget. How magnanimous of us. If only Michigan and the NCAA – all of us, really – had a bit of the perspective they should. Chris Webber was 13 years old, just a junior high prodigy, when Ed Martin first approached him. Ed Martin wasn't just a grown man; he was a savvy, smart, tough and charismatic presence who used all of those traits to become a career criminal. Martin ran a numbers racket out of the Detroit-area Ford plants. It's a somewhat harmless crime – the city now has three legal casinos, after all – but it also isn't a job you get by answering the want ads. It's highly lucrative and you only pull off moving from working the line to running the book (and then keeping it) by being intelligent, intimidating, crafty and cunning. Someone is always coming for you. In short, Ed Martin was a big-time dude. And everyone paying attention knew it. What he wanted, he got, and what he most often wanted was a friendship with young basketball stars in Detroit. Chris Webber was the biggest star. No matter how some NCAA sub-committee thinks the world works, there really wasn't any way they weren't going to connect. None at all. I knew Ed Martin to a small degree before he died in 2003. He was always hanging around high school gyms and came across as a nice guy and a big fan. People who knew him better swore by his generosity and said he had a great passion to help kids who often hailed from disadvantaged backgrounds navigate the very precarious process of getting to college hoops and then the NBA. He was also accused by many of steering players to this high school or that college, which on the macro level isn't a big deal if the kid benefits. There was a reason just about any college coach or pro sports agent looking for Motor City recruits tried to have a relationship with him. At least until he was indicted in 2002 for running an illegal gambling operation and later pleaded guilty to conspiracy to launder money. At best, he was a kind-hearted Robin Hood. There are plenty of those in youth basketball. To not see other possibilities, however, – that maybe he wasn't so selfless – is impossibly shortsighted and naïve. The man made an easy buck in a tough town and that just doesn't happen. Few probably care that there was gambling in Ford break rooms in the 1980s and 1990s, but that doesn't mean it wasn't a criminal enterprise. He was who he was. Maybe he was motivated by the hope he could one day launder some money through the players when they eventually made the league. That's what the federal government alleged in their indictment and that's how Webber always described the money he received – a loan that was to be repaid. Or maybe Martin thought that he could get a cut of their future earnings outright, or a kickback from someone. Or maybe he just liked clinging to stars. No one knows for sure, but in the end you have one extremely savvy adult, armed with cash and gifts, with a clear motivation to use these kids. And then you have the kids, in Webber's case just an eighth-grader, in the cross hairs. That isn't a fair relationship. That isn't a level playing field. This isn't a consensual situation. It's predatory. Chris Webber never stood a chance. Not at the start. And not later, when Webber tried to end the relationship, whatever gifts he was given could've been used to blackmail him – NCAA rules and all. Much is made that Webber wasn't poor – his family was middle class and he attended a prestigious high school in the suburbs. Others see him as this big, powerful physical figure he became, capable of standing up to anyone. Still others consider him some kind of arrogant jerk and couldn't care less. All of it is so self-centered. Apparently no one in the NCAA, no one at Michigan saw it for what it also could've been: an old manipulative hustler sweeping up naïve kids before they even knew what hit them. 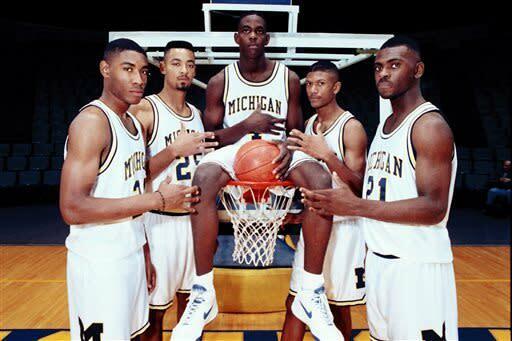 The NCAA and Michigan apparently never bothered to even consider that these guys were victims. They thought the players could just breezily walk away from a guy of that influence anytime they chose. Could they have done that? Could they have handled things better? Of course. To assume this was simple and easy, however, is wrong. Yeah, all these years later, someone sure does owe a phone call and an apology.